Considered lost or dismantled for decades, this one-of-a kind crown of agates was recently placed on exhibit at the Lincoln County Historical Society’s Burrows House Museum. From the 1950s until a few months ago the fate of the crown, and who actually made it, was a mystery. It is now certain the agate crown was made by A.L. Thomas approximately 100 years ago. 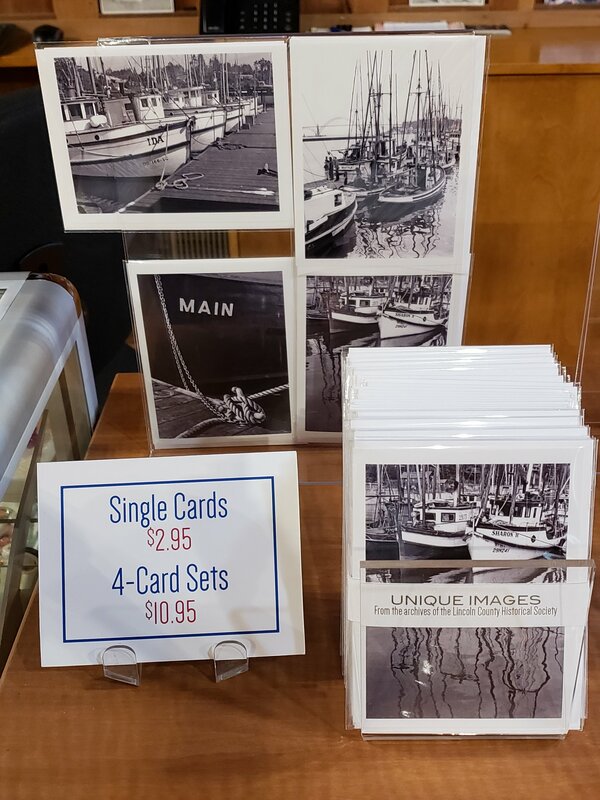 Thomas first came to Newport in 1895 where he established a gift shop specializing in his hand-crafted agate jewelry and his photography in the form of postcards and framed pictures. Thomas was very particular about the agates. He traveled to eastern Oregon and even out-of-state on agate hunting “vacations.” Apparently, he did not use a lot of locally found agates as the quantity of suitable stones was undependable. The generous amount of agates and metal Thomas used in this one- of-a-kind crown make it quite heavy, however, the museum has no other crowns to compare it with, nor has anyone on staff ever been crowned. The first known appearance of the crown was at the Salmon River Highway dedication in July 1930. Mrs. Rhoda Quick Johnson the “queen mother” of the celebration, arrived by covered wagon, sat on her throne, the first chair ever made in Oregon, and was crowned by Governor Norblad. This is documented in photographs of the occasion. The next known use of the Thomas crown was at the annual coronation of the Crab Queen, the highlight of the annual Newport Crab Festival. The first festival has held in 1938 and continued until 1952. At the height of its popularity, literally thousands flocked to Newport for a free crab lunch, a host of crowd-pleasing events, a carnival, and door prizes. At its peak, a new car, washer, and clothes drier were given away. A.L. Thomas did not live long enough to see the Crab Festival and queen crowning at its peak. He died in 1940. The store passed to his son Richard Thomas who moved the store away from Nye Beach to Highway 101. In 1947 Richard sold the store to Ralph W. Emerson. The crown likely passed to Ralph Emerson with the sale of the store. Emerson closed the shop after just a few years and moved to Bend. The Crab Festival came to an end when crab became too expensive to give away and the festival was too successful for its own good, overwhelming the entire town. The Crab Festival is the last documented use of Thomas’ agate crown. This rather striking crown made a lasting impression on those who saw it. From the 1960s, until going on exhibit recently, locals occasionally came to our museum thinking we should have it on exhibit or at least know its whereabouts. In the early 1990s, museum staff had occasion to interview Helen Payne. At the time, she was the last surviving child of A.L. Thomas. She believed the crown had been taken apart; the agates sold and/or reused for less royal jewelry. Unbeknownst to most folks, when Ralph Emerson died in 1990, he had the crown in his possession. It then passed to his children. Also passed down was the story that it was their father who made the crown. Those who knew of this crown thought of it as the Emerson Crown. Recently, the Emerson family loaned the crown to the Historical Society for exhibit purposes. Photos in the Historical Society’s collection well document this exact crown in use at the 1930 Salmon River Highway celebration – 17 years prior to Emerson’s arrival in Newport. Richard Thomas, son of A.L. Thomas, was on hand for the coronation of the queen using the crown his father made.